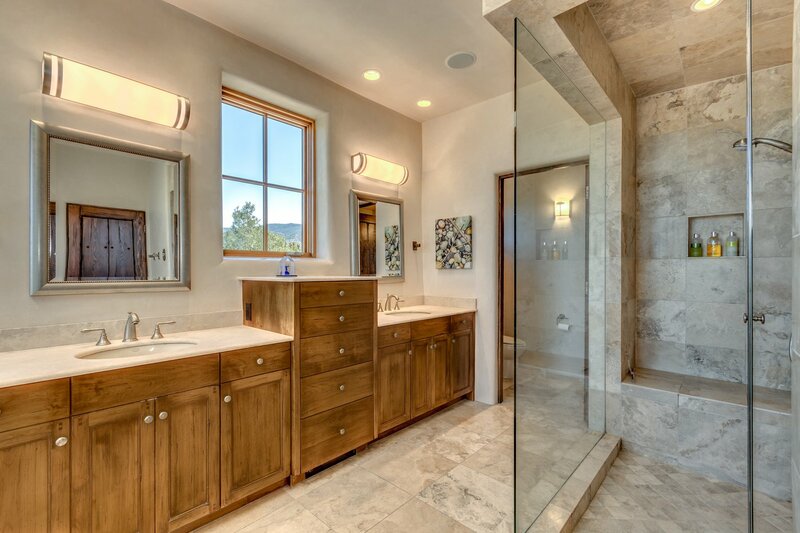 Rarely does a property come on the market that is perfect. 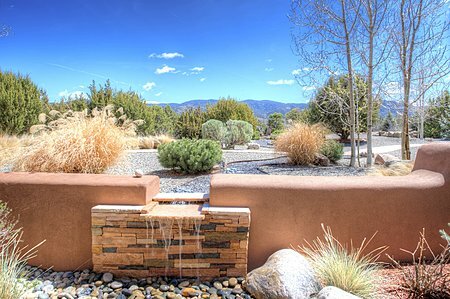 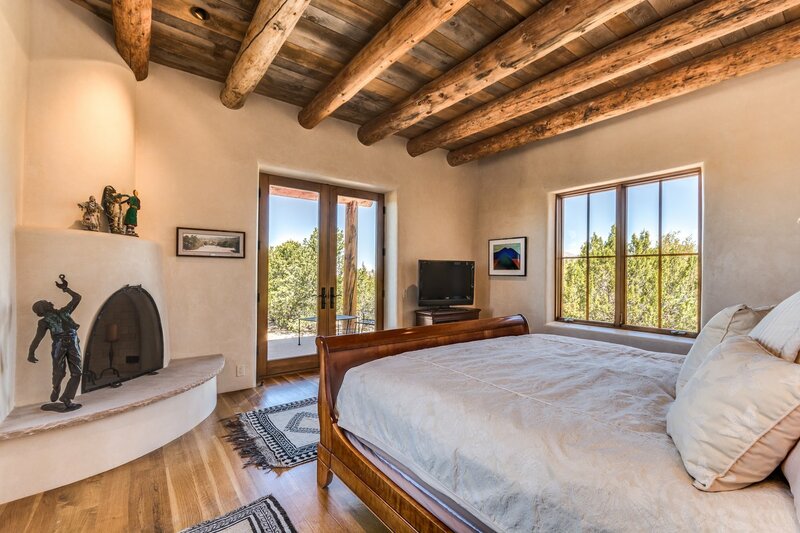 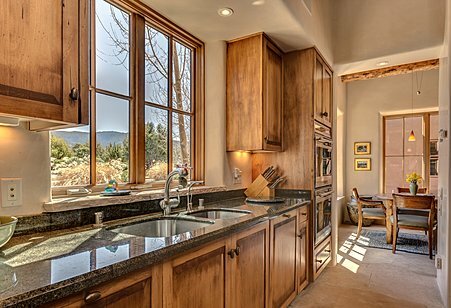 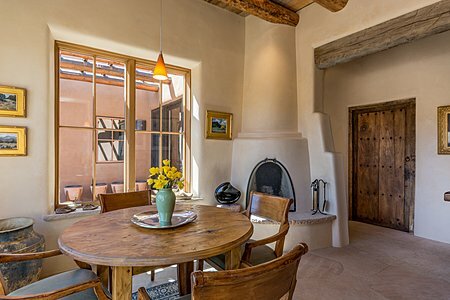 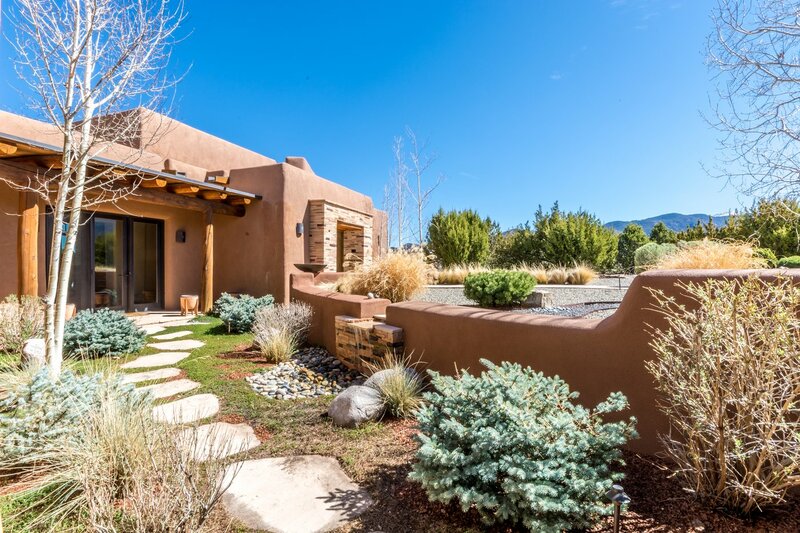 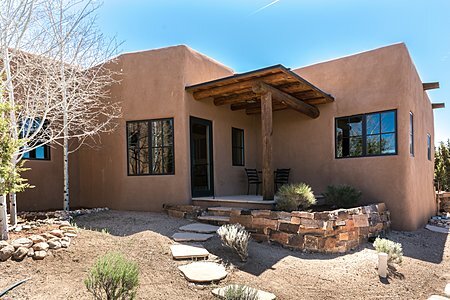 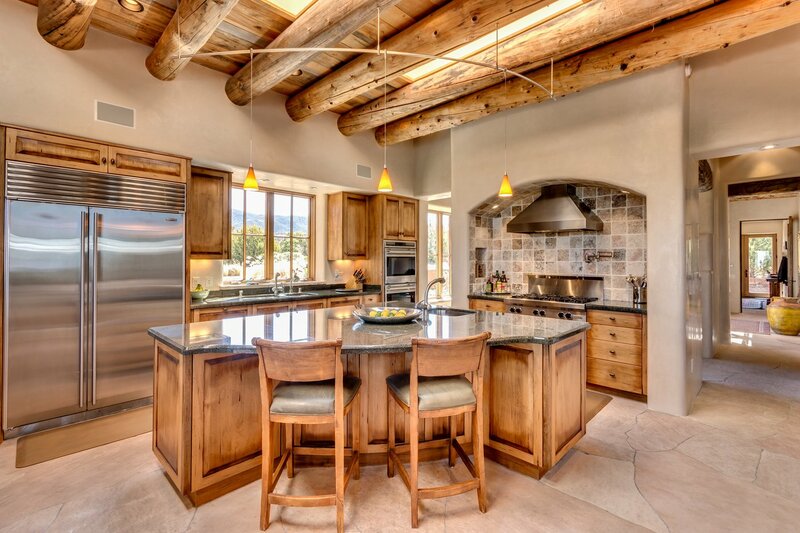 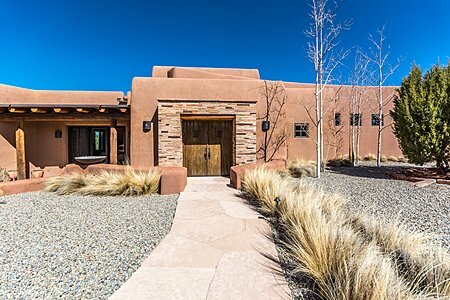 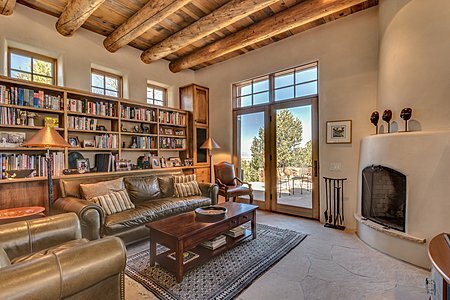 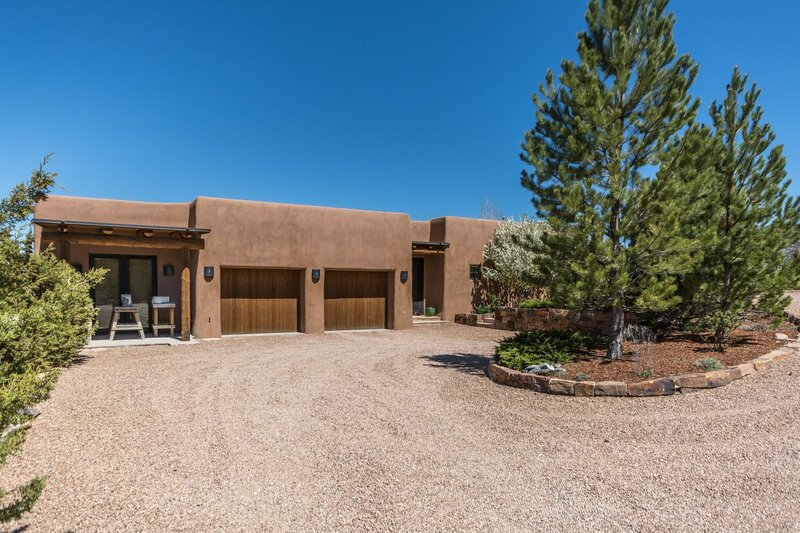 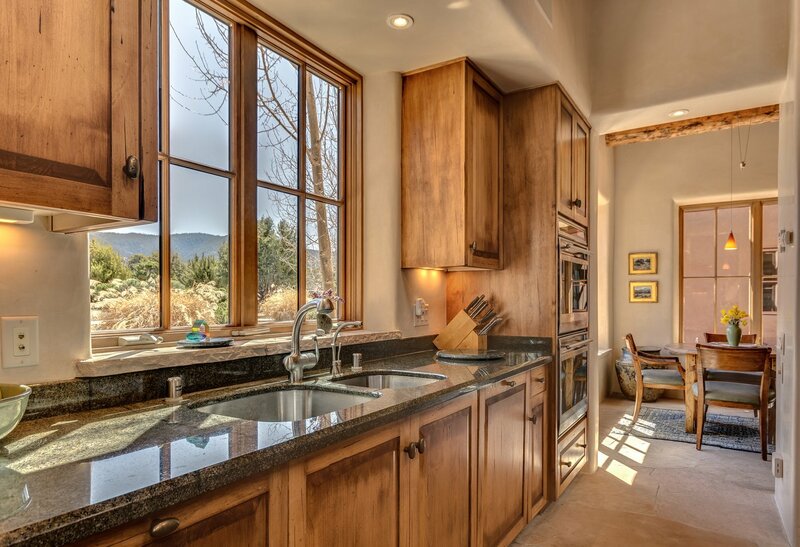 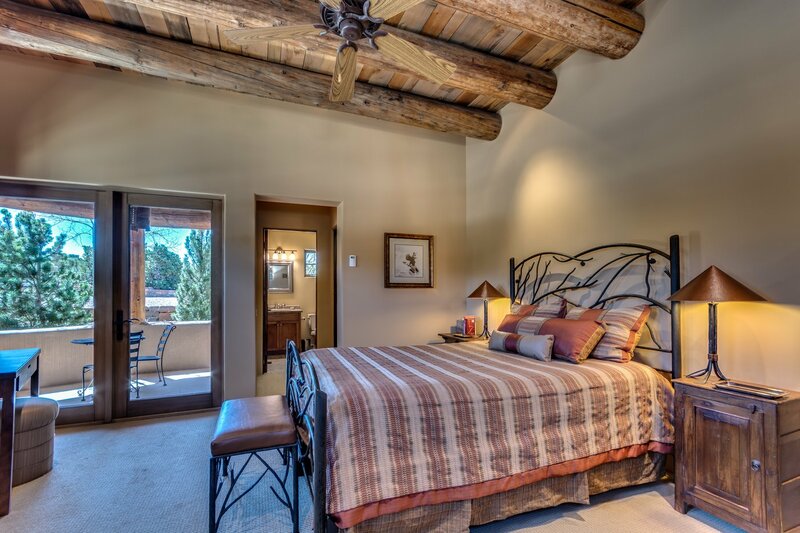 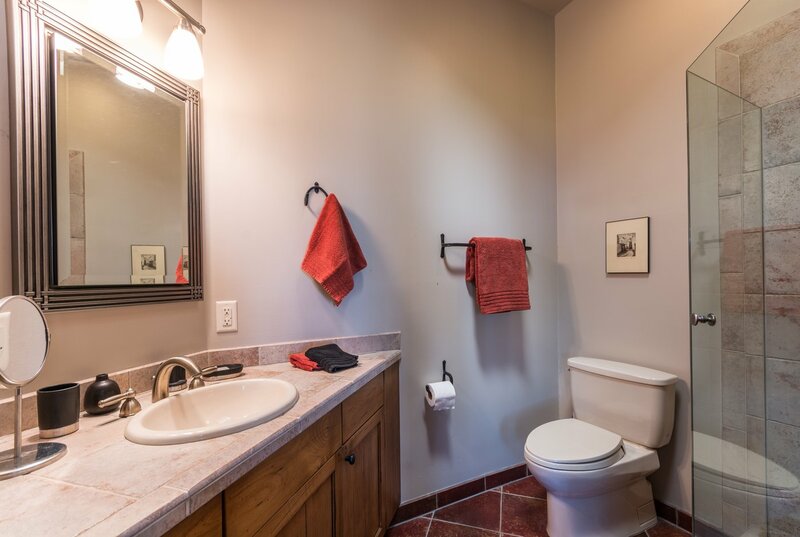 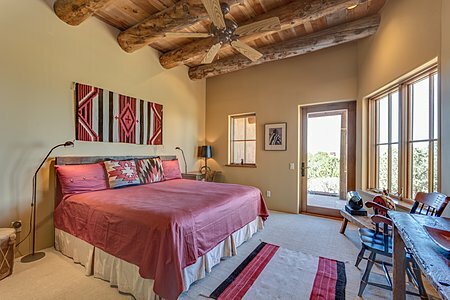 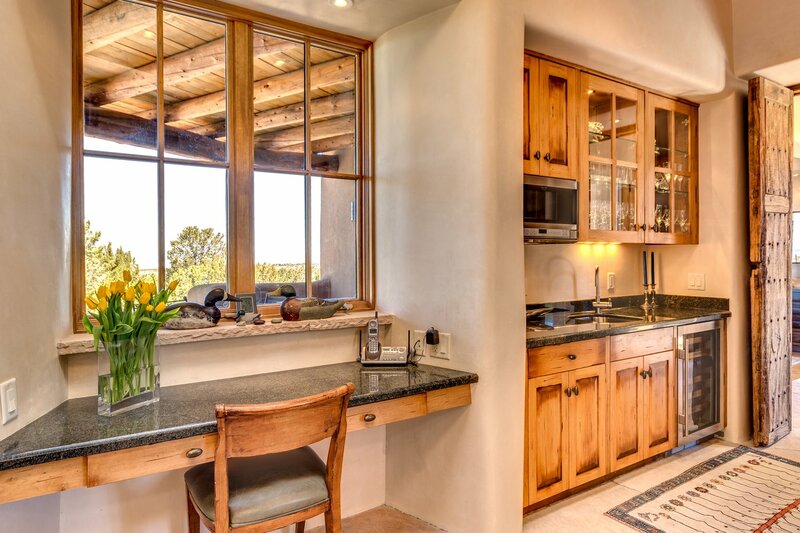 Adobe foam insulated home, built in 2005 on 5 AC, offers sweeping views of the Sangre de Cristo & Jemez Mtns, as well as the Pojoaque Valley all the way to CO. It features 5143 sq. 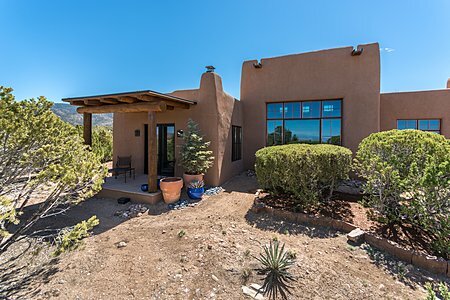 ft. of heated, 657 sq. 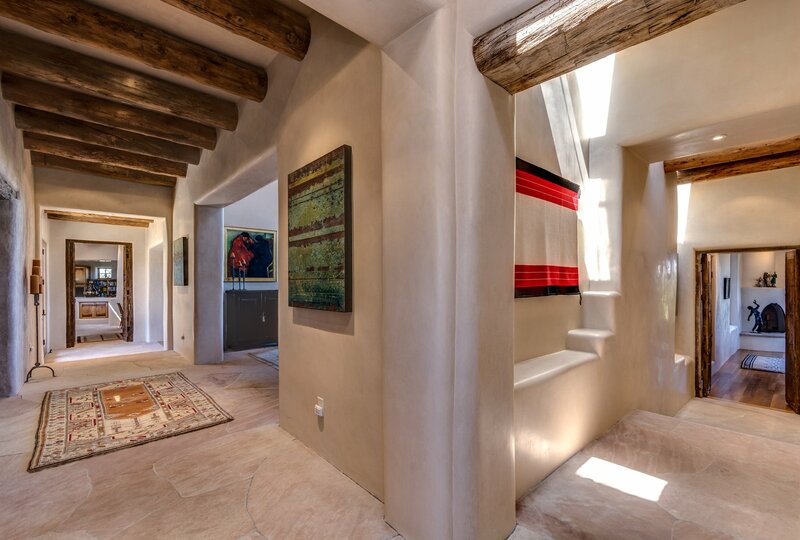 ft. of unheated space & 768 sq. ft. of portals. 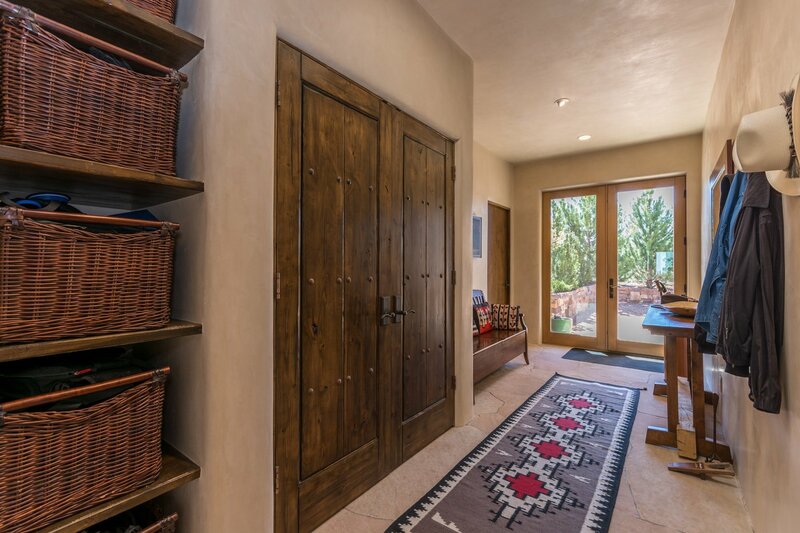 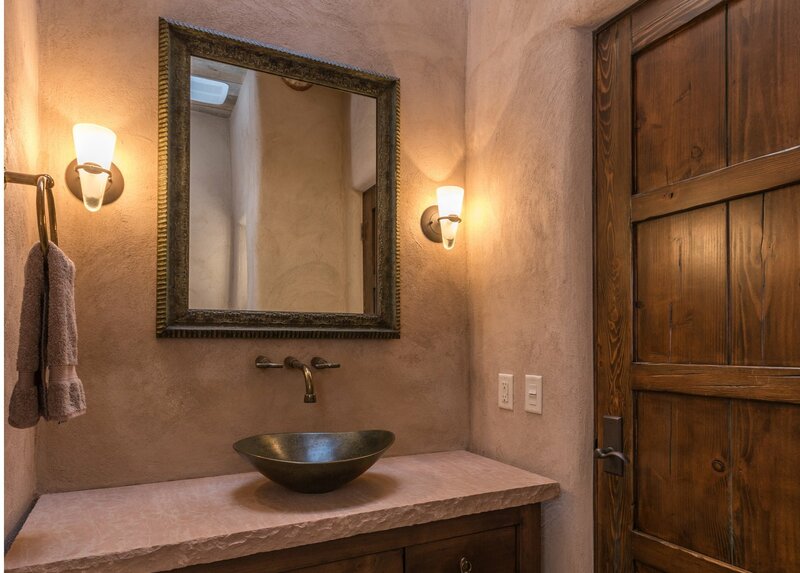 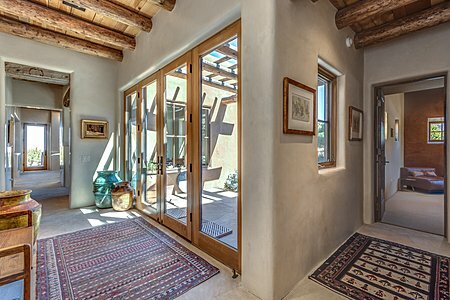 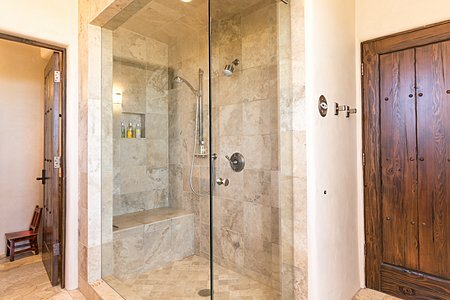 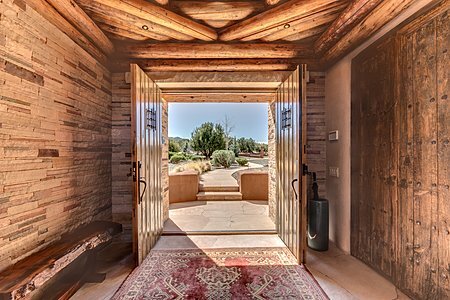 Flagstone walkways lead you past the sound of falling water to the dramatic entrance made of dry set Anasazi stone containing a foyer capped by a Hogan-style entry ceiling & walls covered with earthen plaster made from mud taken at the building site. 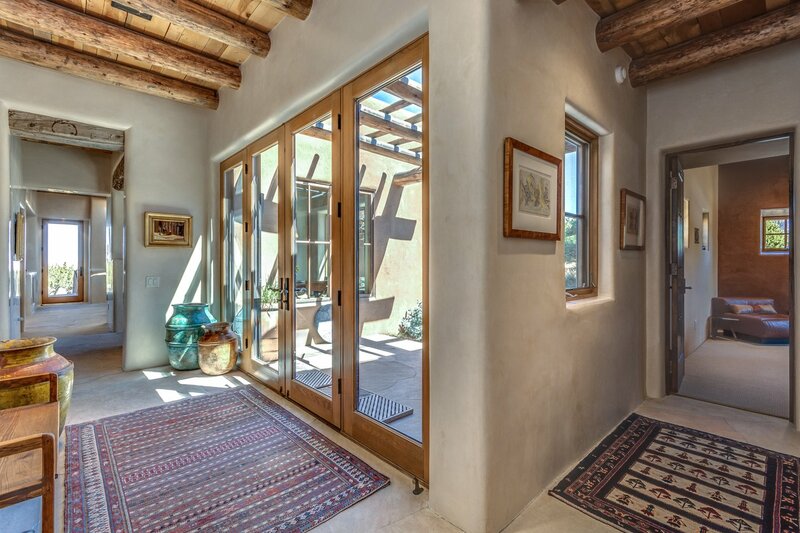 Flagstone floors by master stone mason John Morris are found in the entry, living room, kitchen, den, breakfast room & all hallways & are continued on patios & portals. "Dead standing" vigas & latillas (naturally patinated by forest fire) exist throughout. 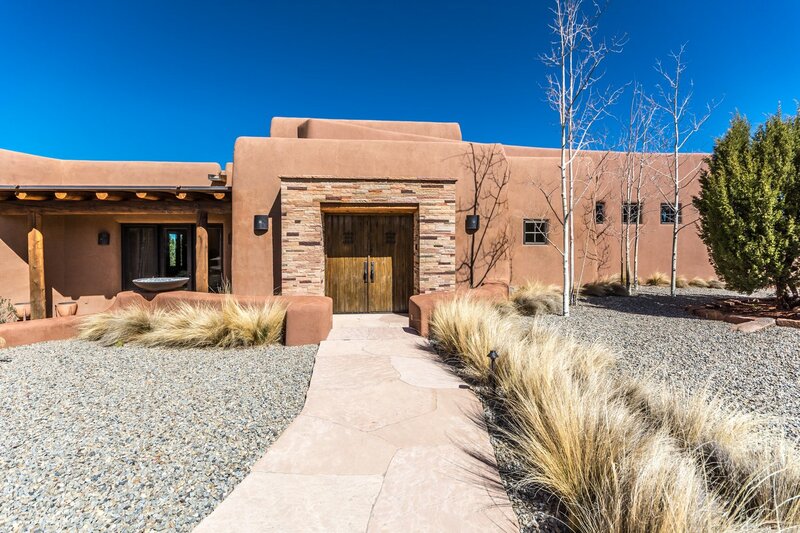 Antique Mexican doors, antique hand hewn lintels, Wawirka hand cast bronze sink in powder room, copper clad windows, 7 fireplaces & quarter-sawn white oak floors in dining room, library & master bedroom make this a truly special home. 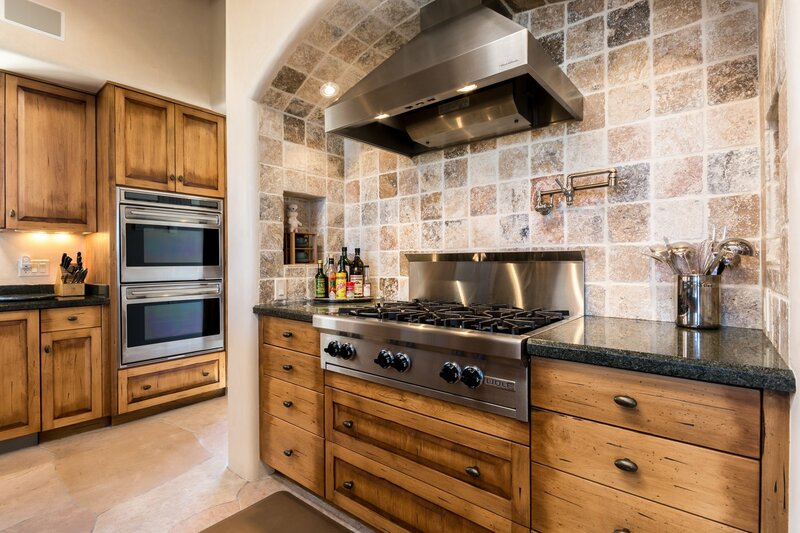 The large Kitchen has a Sub-Zero refrigerator/freezer & wine cooler, Wolf double oven, warming drawer & six-burner gas range, 2 Asko dishwashers, 4 stainless steel sinks, 2 garbage disposals, Sharp Carousel microwave, Instant Hot/Cold water "Frank Little Butler", pot filler & additional refrigerator. 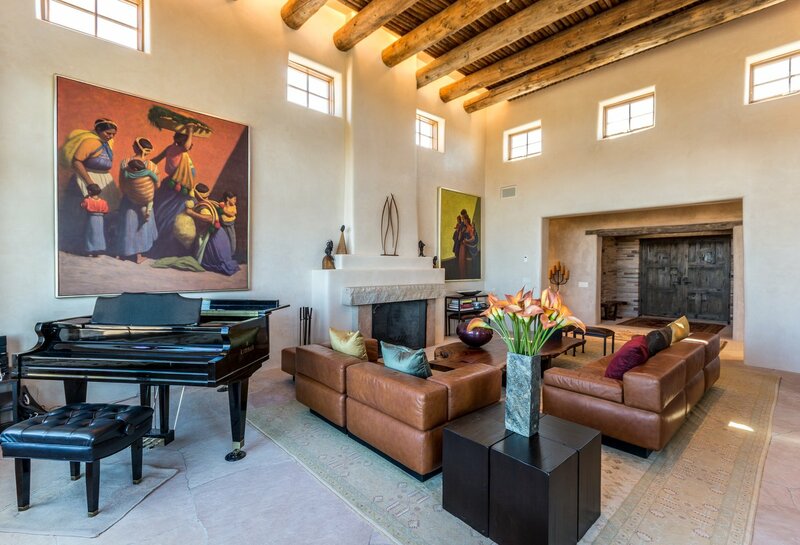 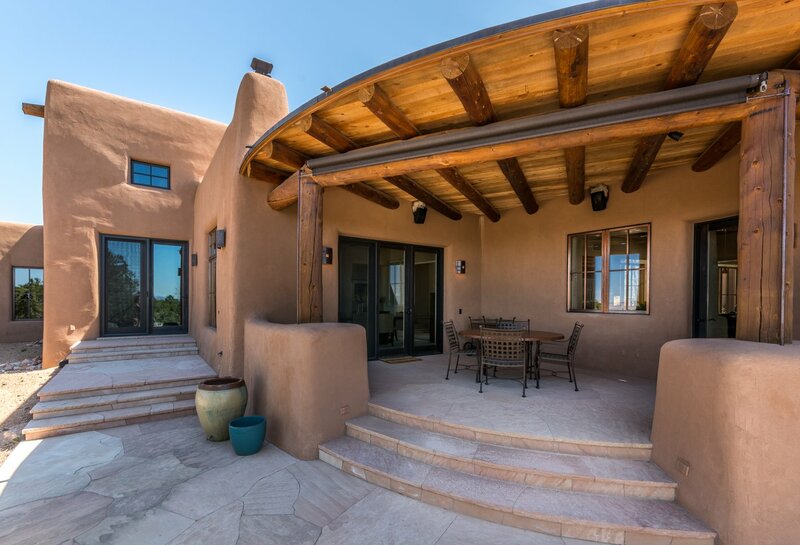 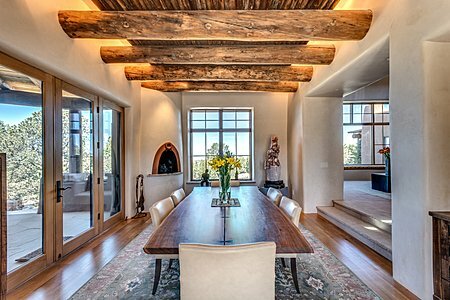 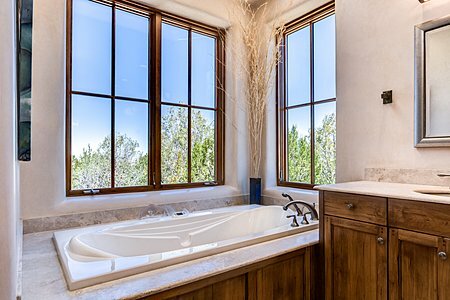 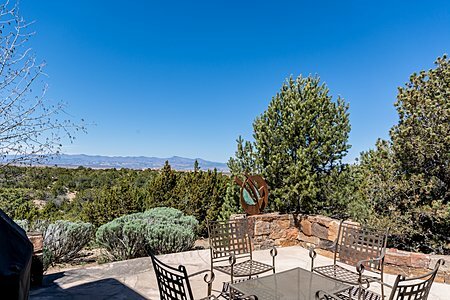 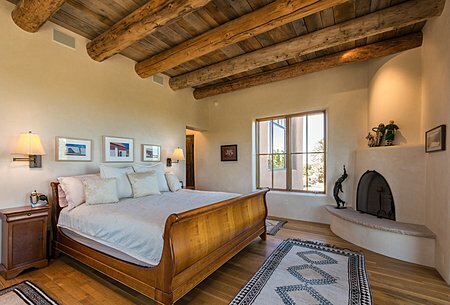 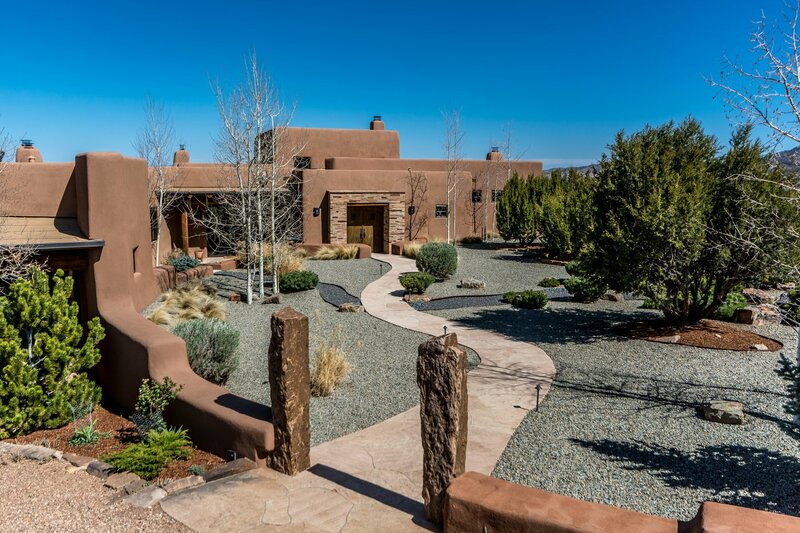 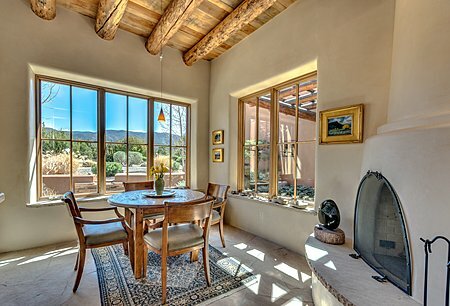 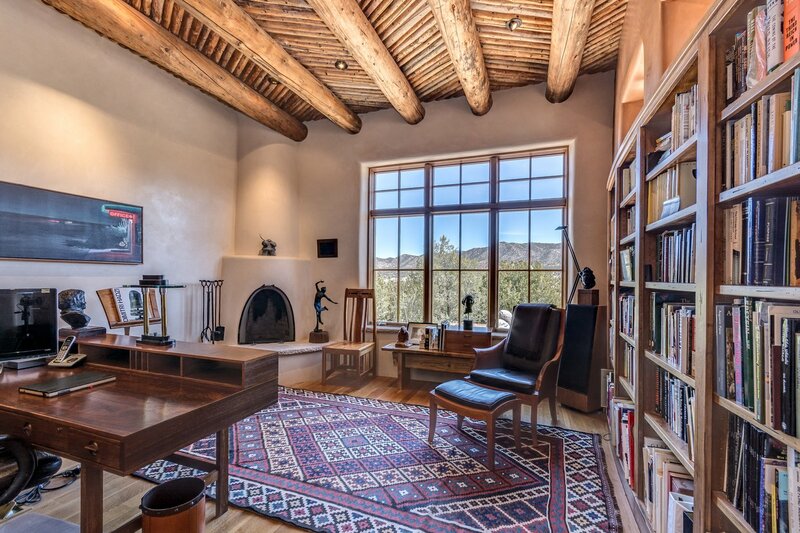 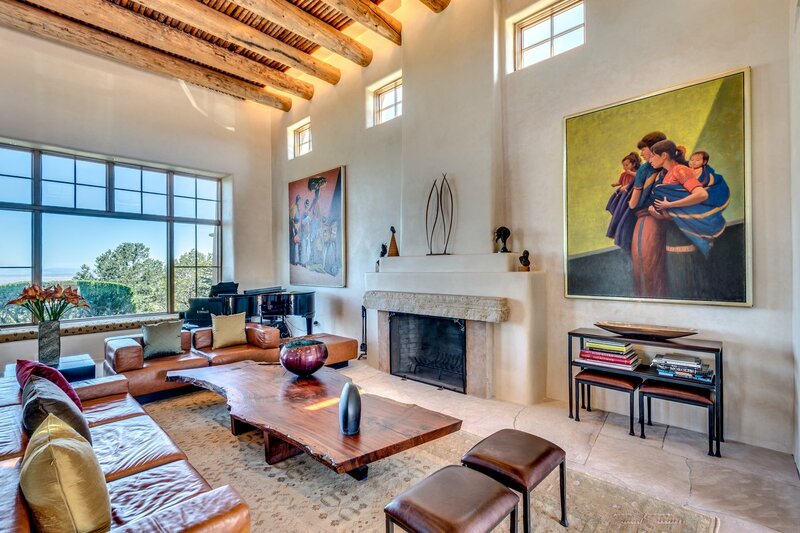 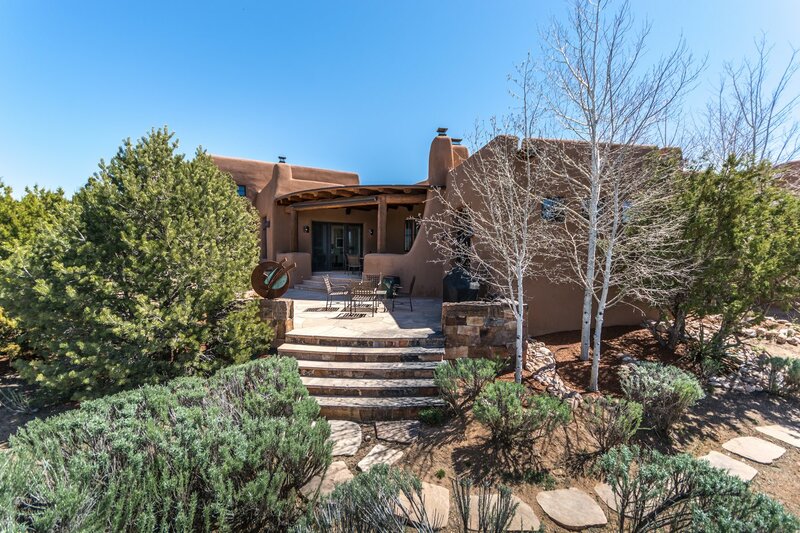 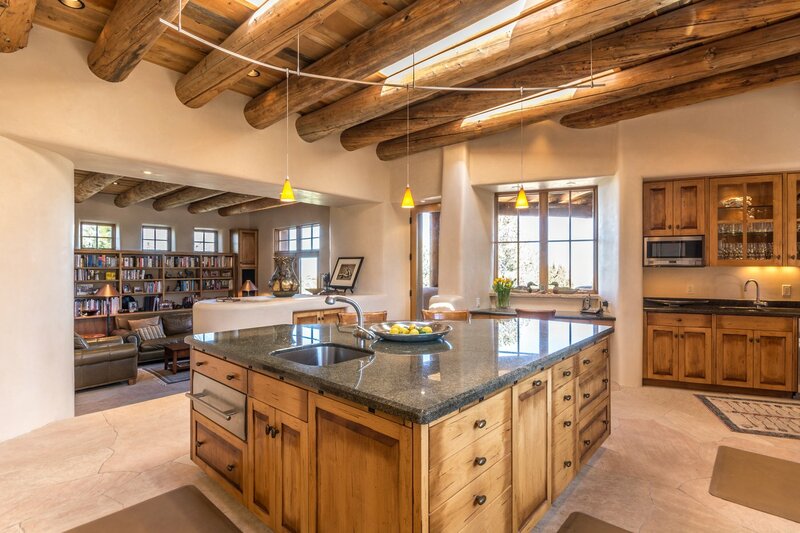 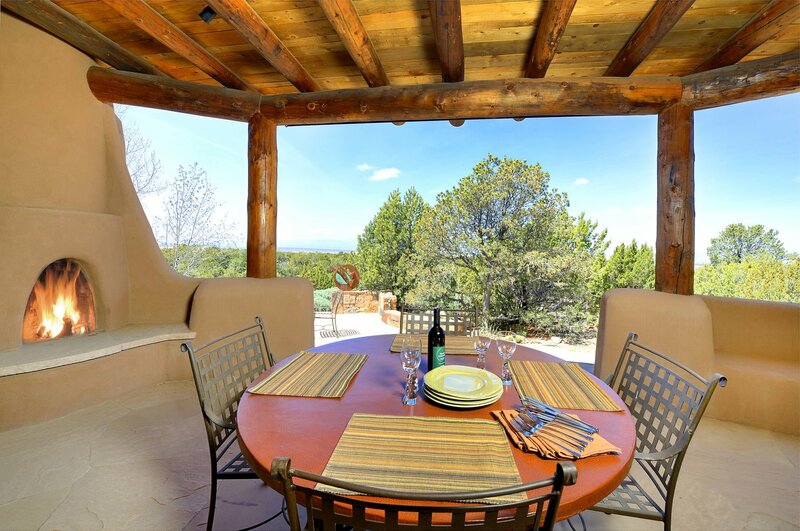 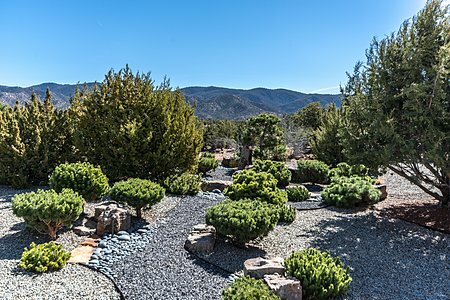 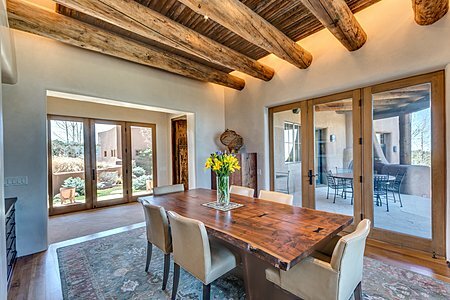 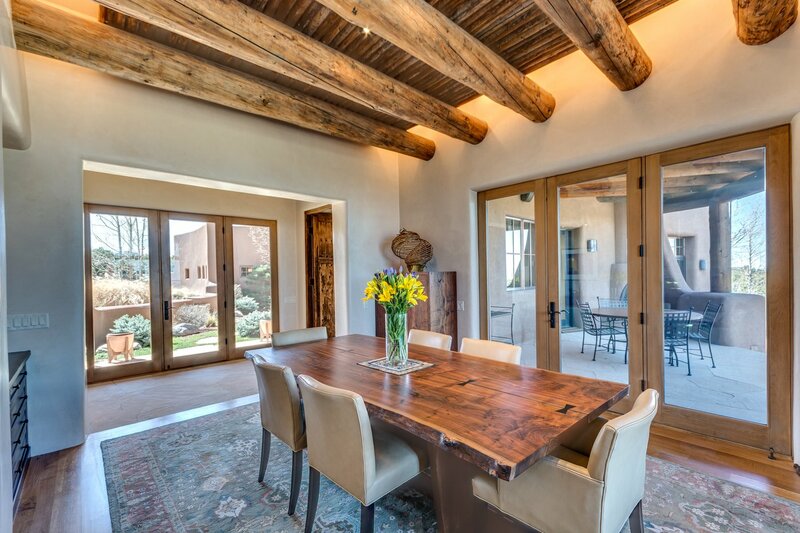 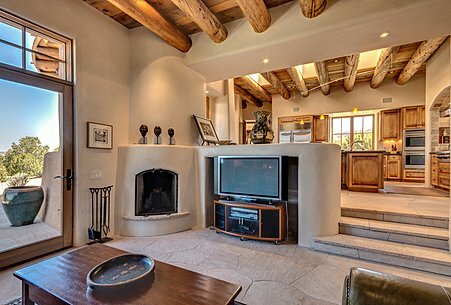 This property gives you the ultimate in Santa Fe Living which includes views, exceptional living space, privacy & pure excellence.